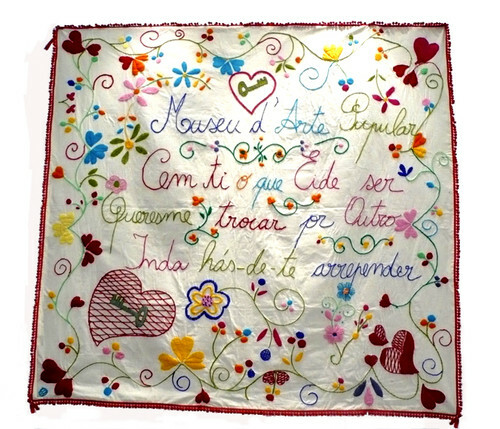 I believe that nowadays the “fiancé kerchiefs” are the only kind of Portuguese traditional embroidery that all Portuguese people know and care about. Maybe I’m being too harsh, but for better or worse, fiancé kerchiefs became fashionable! 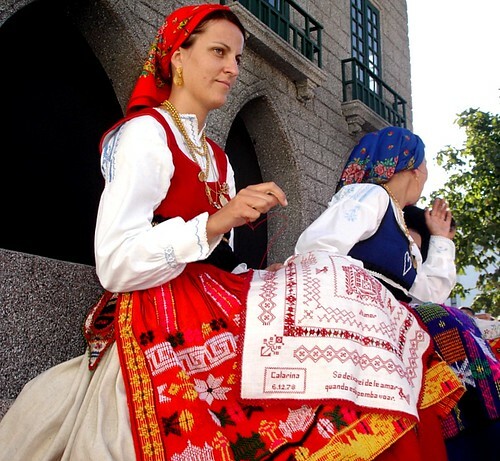 Let’s try to understand the history behind them… Many, many years ago, when a girl was close to marrying age she made an embroidered handkerchief of fine linen or cotton cloth. 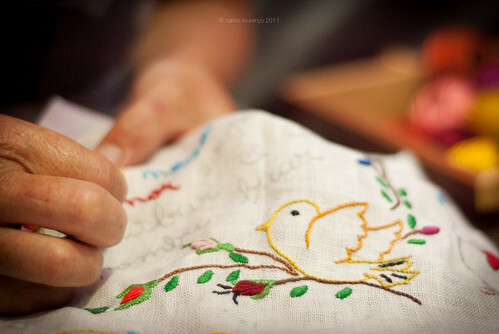 To carry out this work, the girl used the knowledge she had acquired about cross-stitch in childhood. The handkerchief was proof of the embroiderer's devotion to the man she was in love with and was, for such a purpose, offered to him, the 'boyfriend'. It was in accordance with his attitude of using or not using it publicly, over his Sunday best suit or as neckerchief, that the dawning of a love connection was decided. Originally they were embroidered using cross-stitch in red and black. But as it was very time consuming, representing weeks and sometimes months of patient evenings spent by the embroiderer, girls were compelled to find a quicker way of doing it. So, with time, free embroidery stitches replaced cross-stitch and many other colors were added to the red and black, bringing much more folklore; but the feeling behind them remained the same, along with their primitive symbology, too. The kerchiefs have portrayed various kinds of sentiments felt by marriageable girls, expressed through symbols of faithfulness or religious devotion in regard to the wedding act, and through quatrains that in most cases reveal the illiteracy of the embroiderers, as bad spelling or misspellings were common. Here you have a quatrain that I tried to translate... I know I cannot be faithful to the genuine beauty of these words and above all to their simplicity, but I did my best!! Nas asas de um passarinho. Write on the wings of a little bird. What a beautiful, sentimental tradition. I had never heard of fiance kerchiefs, but what a lovely sentiment and tradition! :) Thanks so much for sharing. What a fascinating blog today I just love the fiancé kerchiefs and would like to adapt this idea and make a special kerchief for each of my two little granddaughters as a memory keeper for them, they look very precious to me and a wonderful idea and you could make them so pretty. Thanks for your thoughts and words Gabi. This is so interesting. My culture (Hutterite) had the very same tradition. I was in a sewing room last summer, where the ladies' mother in law's kerchief to her betrothed was framed and displayed.